Stihl has listened to consumers and released a long reach hedge trimmer. It its powered by the ever reliable and efficient 94 C-E engine which is super lightweight and efficient. The 2-mix engine combines the low consumption of fuel and therefore produces a lesser amount of emissions but still maintains a high rate of acceleration. The Stihl ErgoStart makes the machine easier to operate and the blade rotates at an adjustable point by 145 degrees to help you reach the flat top of those hedges. 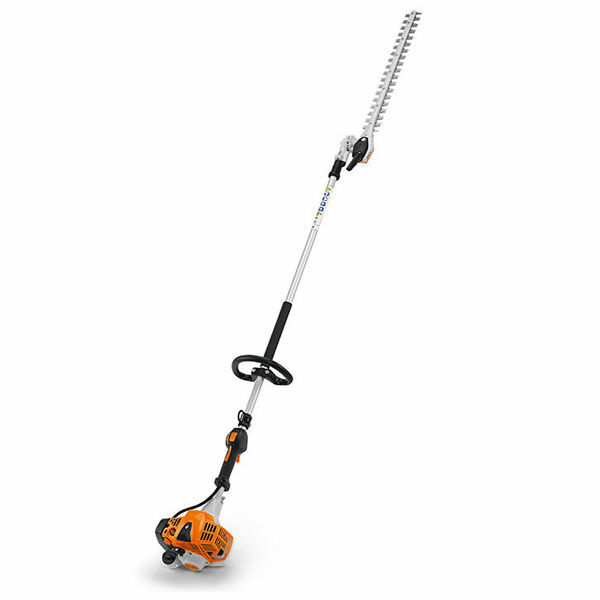 This engine is specially designed for Stihl's new hedge trimmers which utilises low consumption of fuel to produce a machine that releases less emissions and still provides the same excellent acceleration. It also has sufficient power reserves for cutting thicker shrubs. This Stihl innovation cuts the required effort to start the tool by half, resulting in the starter cord only needing to be pulled at just one third of the normal force!!! We are so confident in how easy this thing is to start that all you need is two fingers and a genial pull action! this enables the operator to use the hedge trimmer in a much more economical way. All is required is for you to wind the wheel backwards reducing the speed keeping it running at partial load. This is ideal if you are cutting light shrubs and don't require the full force of the engine, it reduces fuel consumption and improves the efficiency of the job. The double-sided cutting blades ensure a powerful and precise cut even through the thicker branches and can be disassembled and sharpened easily. The cutting blade can be adjusted at different angles with increments up to 145 degrees in two directions. This makes tricky hedges a breeze to cut and the head can also be folded parallel to the shaft and locked for transport making traveling between jobs a lot easier. Henderson Mowers & Chainsaws Ballarat stocks a range of high quality affordable hedge trimmers for the people of Ballarat. 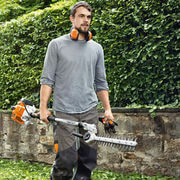 In store you will find a range of Stihl, Honda and Victa hedge trimmers in either a petrol, electric or battery range. 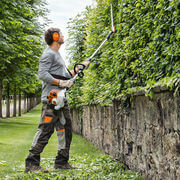 For excellent advice and quality hedge trimmers call into our showroom today and we will be happy to help.